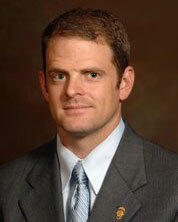 Attorney Matthew McBee was born in Fort Smith, Arkansas in 1974. After completing his BA at Emory University in 1996, he went on to earn a Juris Doctor degree at the University of Oklahoma College of Law in 1999. He was admitted to the bar the same year admitted to practice before US District Courts for the Eastern and Western Districts of Oklahoma. During Law School he participated in several moot court teams, including Alternative Dispute Resolution Team (1997) and the Jessup Moot Court Team (1998) and he is also a member of Phi Delta Phi. Attorney Matthew McBee has received numerous honors. Among his noteworthy accolades is the American Jurisprudence Award for Agricultural Law in 1997. Matthew began his legal career with a small firm in Oklahoma City focusing primarily on real estate and mortgage foreclosures. In 2003, Matthew left private practice to work in the legal counsel office as Deputy General Counsel for Governor Brad Henry. While in the General Counsel’s office, Matthew’s duties included Pardon and Parole Review, Amber Alert Coordinator, Extraditions and Legislative review for criminal justice. In 2006, Matthew left the Governor’s office to open this private practice with his father George McBee retired District Judge. His current practice areas are real property, mineral fraud, guardianships, criminal law, probate and business organizations. Attorney George H. McBee was born in Poteau, Oklahoma in 1942. He received a B.S. in Chemical Engineering from the University of Oklahoma in 1964. By 1967 he had earned a Juris Doctor at the University of Oklahoma College of Law. He was admitted to Oklahoma Bar that same year. George is a member of the LeFlore County and Oklahoma Bar Associations and is admitted to practice in the Federal District Court for the Eastern District of Oklahoma. He practices in several areas, but focuses primarily on real property, oil and gas, probate and criminal law, trial and appellate practice. George is a member of the Phi Delta Phi legal fraternity and Lambda Chi Alpha Social fraternity. For twenty years beginning in 1983 George was the District Judge for the 16th Judicial District of Oklahoma (Haskell, Latimer and LeFlore Counties), and was president of the Oklahoma Judicial Conference in 2002. He is a member of the LeFlore County and Oklahoma Bar Associations as well as Phi Delta Phi. He spent as Judge Advocate General in the Marine Corps after graduating from Law School in 1967. After leaving the Marine Corps, George entered private practice in Poteau, Oklahoma with Senator Jim Hamilton, forming law practices of Hamilton & McBee, and then, Hamilton, McBee & Warren.